Born in Canada, James Cameron moved to California in 1971 at the age of 17. He studied physics at Fullerton Junior College while working as a machinist, and later a truck driver. Setting his sights on a career in film, Cameron quit his trucking job and went to work on low-budget science fiction films as a self-taught designer and visual effects artist. Two of Cameron’s passions—filmmaking and diving—blended in his work on the movies The Abyss and Titanic. The latter required him to make 12 submersible dives to the wreck itself, two and a half miles down in the North Atlantic. 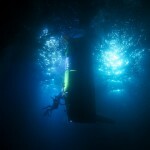 Bitten by the deep-ocean exploration bug, Cameron formed Earthship Productions to make documentary films about ocean exploration and conservation. Since that first expedition, Cameron has led six subsequent expeditions, including a forensic study of the Bismarck wreck site and 3-D imaging of deep hydrothermal vent sites along the Mid-Atlantic Ridge, the East Pacific Rise, and the Sea of Cortez. He has made 72 deep submersible dives, including 33 to Titanic, logging more hours on that ship than Captain Smith himself. Of these dives, 51 were in Russian Mir submersibles to depths of up to 16,000 feet. To bring—with unprecedented clarity—the experience of deep-ocean exploration to a global audience, Cameron set to work on a digital 3-D camera system, which he developed with engineering partner Vince Pace. In preparation for his 2001 expedition to the Titanic wreck, Cameron developed revolutionary fiber-spooling mini-ROVs, as well as other deep-ocean lighting and photographic technology. His team’s historic exploration of Titanic‘s interior was the subject of his 3-D IMAX film, Ghosts of the Abyss. 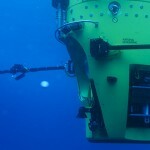 DEEPSEA CHALLENGE was the eighth deep-ocean expedition Cameron led. His engineering team spent seven years building the unique manned submersible capable of diving to the ocean’s greatest depths. In March 2012, he piloted the sub (called the DEEPSEA CHALLENGER) to the Challenger Deep, in the Mariana Trench, at a depth of 35,787 feet (6.77 miles/10.90 km). The expedition included numerous science partners and shed light on the virtually unknown habitats in the New Britain Trench, the Challenger Deep, and the Sirena Deep. As an explorer, Cameron has been equally fascinated by both outer and inner space. He has worked for years with space scientists and engineers developing viable architectures for the human exploration of Mars and has been involved with a number of robotic space exploration projects. Cameron served on the NASA Advisory Council for three years, is an active member of the Mars Society and the Planetary Society, and remains as committed to the exploration of space as he is to the exploration and conservation of the oceans.